scroll down one post or click HERE. Caribbean Blue, Shoreline and Sunshine are the colors for the Play Date Cafe this week. How summery! 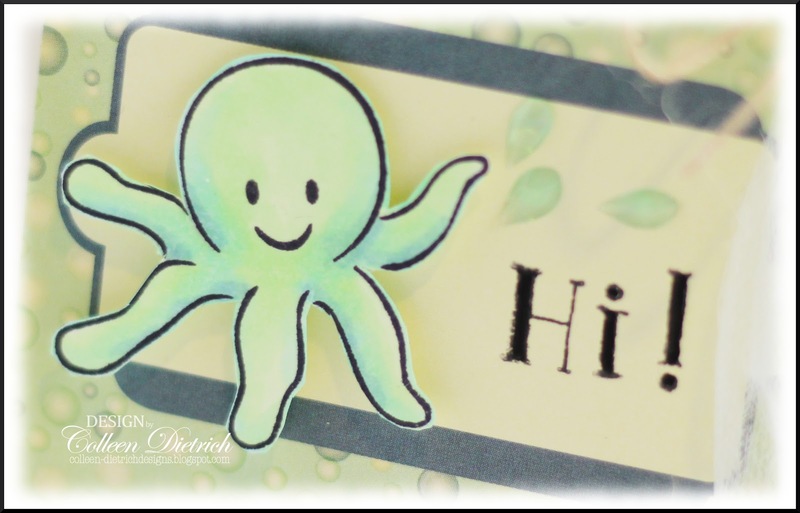 The sentiment is made with Doodlebug Alphabet by Doodlebug Designs. And see the splash next to the octopus? Those are Tear Drop Rain Dots by Cloud 9. Bought 'em at JoAnn's months and months ago, and finally broke into the package. I used to decorate a lot of packages with tulle instead of ribbon, and have quite a bit of it left. It seemed like a nautical piece to add, along with some twine. Our special guest at The Play Date Cafe this week is none other than Teri Anderson! She's one of the Go-To Gals at Paper Crafts Magazine, and is such a celebrity in this paper-crafting world. We're so excited to have her! The sponsor of the Cup of the Week Prize is none other than Simon Says Stamp! Please come join us -- can't wait to see what you do with our colors!! Adorable card. Nice touch with the tulle and twine. Like the new white hydrangea blog header pic! Gorgeous colours and I know a little Niece who would adore that image!! Hope all is well with you across the water - today, it's actually stopped raining!!! Hola Colleen, what bunch of amazing cards!, i love specially the tea set, i love my cup of tea!! !a great work Colleen, as always your're the queen of cards!!!. Hugs from Palma the melted island. Super cute card Colleen! Love those papers and that tulle is the perfect touch! okay, cutest card ever...love the new color challenge! So cute! Love your image and I never get tired of this paper, if I never run out it will be okay, lol. Oh, how cute! What a friendly greeting, and so very summery! The octopus is a cutie! I absolutely LOVE this, Colleen!! You are so right to be pleased with this card--it turned out SO cute. LOVE that little octopus! I've got to put that on my DeNami must-have list :). Your Cosmo Cricket papers are perfect for this week's PDCC colors--great choice there! And that tulle ties it all together perfectly. Congrats on putting together such a fantastic card! 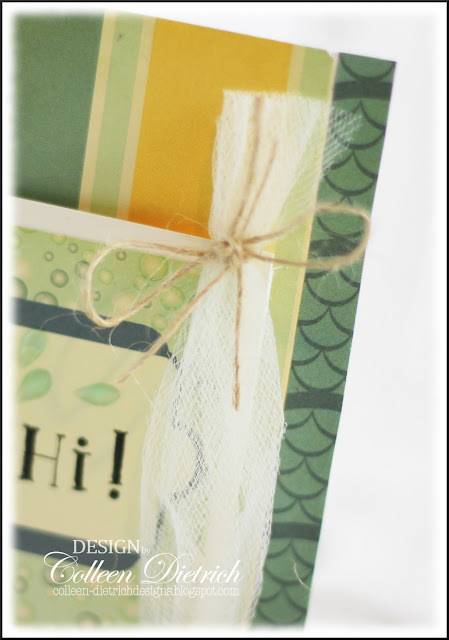 I love the tulle on your adorable card, Colleen! It's hard to break those rain drop packages open, isn't it? I had mine for years before I could bring myself to do it, LOL. You are better than me! What a fabulous card----LOOOOOOOVE the tulle and the papers! PERFECT match for this color story! Wow - those colors are the best in the inspiration photo and you captured them all in your sweet card!!! I love the card - such a fresh feel and soooo happy. Cute!!! Hugz! That is the cutest octupus, Colleen. Your dew drops are perfect to go with this little guy. I do like to use tulle to wrap packages, too. 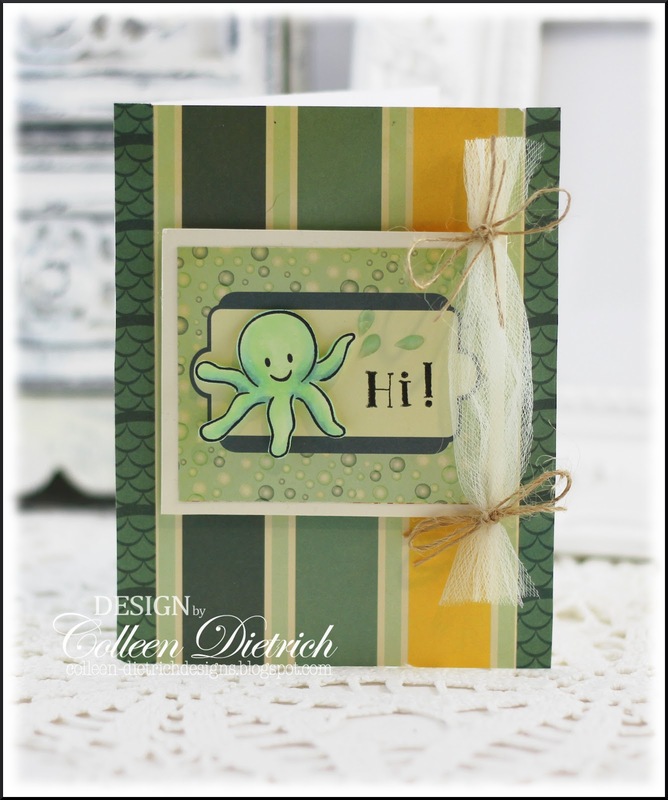 Sweet card with adorable octupus! Great addition of tulle, which looks like netting! Perfect design paper, too! Have a great weekend, hugs! This is ever so cute, Col! LOVE your tulle treatment and those fun Rain Dots, too! They're the perfect finishing touches! Oh! And my PDCC goodies arrived on Wednesday! Woohoo! Better late than never ;)! Hugs! Colleen this is awesome! LOVE the netting pulled together with the twine!!! Wow soooo CUTE! I like that little tulle embellishment that you made. It's very clever. Blessings! Simply adorable! 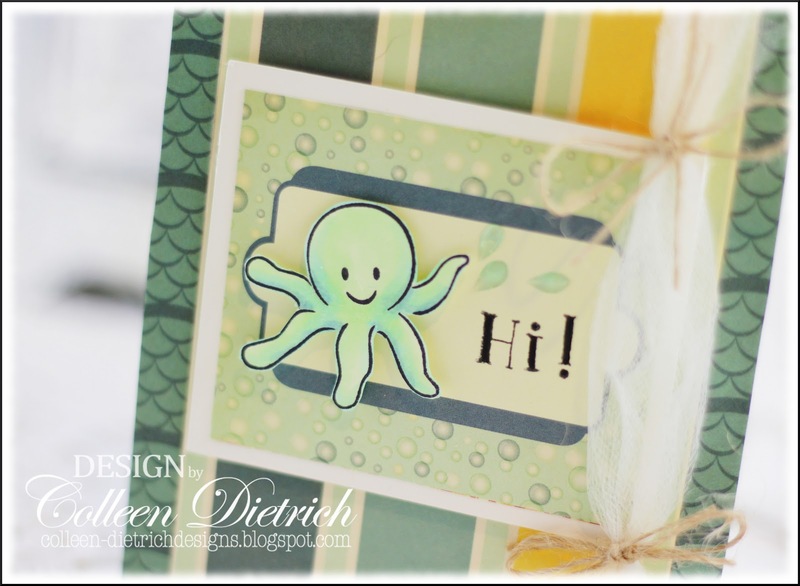 Love these colours, and the sweet little octopus! I must get my thinking cap on now! This is so darn cute. That image makes me smile. Brilliant! Not only did you ace the color challenge, but that tulle accent is so clever! Great work! I love that cute octopus! I don't know that I'd seen one in a stamp before! Beautiful papers and I love the knotted netting! Nice touch!